A band who have often been hailed as ‘the next Metallica’ by enthusiastic journalists, the trajectory of stylistic changes Mastodon have undertaken does admittedly add weight to the comparison. Moving from roughshod aggression on their Remission debut, they incrementally expanded their vision up to a progressive metal peak on full-length number four, Crack the Skye, before stripping things down to radio-friendly hard rock on their fifth (‘Black’) album The Hunter. Fans might then expect latest effort Once More ‘Round the Sun to represent the equivalent of ‘Tallica’s Load – instead, it stands as a comprehensive summary of their career to date, and an unquestionable message that they remain one of the premier heavy acts of the 21st century. Like its predecessor, much of its content is far more direct in grabbing your attention than the Mastodon of old – and so though opener ‘Tread Lightly’ builds from a quiet, shimmering intro there’s not much room for respite before the riffs and vocal hooks dig into your brain. On the other hand, the straightforward rock n’ roll formula of The Hunter is often beefed up here with embellishments like the grinding crust riffs of ‘High Road’ and guitar histrionics of ‘Aunt Lisa’ (which even packs in a bizarre cheerleading outro). Those who have missed the virtuosity of Mastodon’s earlier work will find much to enjoy here, the stop-start guitar solo maelstrom on the tail-end of ‘Halloween’ showing that Brent Hinds and Bill Kelliher remain some of the best in the game. Troy Sanders’ bass work is nice and high in the mix, providing a satisfying crunch, but as ever it’s the hell-for-leather drumming of Brann Dailor that steals the show. The sticksman’s increasing taking up of the vocal mantle also sets out Once More ‘Round the Sun from its predecessors, his pure tones contrasting nicely with Sanders’ gruffness and Hinds’ sneer – the Deftones-channelling chorus of ‘Ember City’ represents one of the album’s finest moments. If anything, the weaker moments come when Mastodon don’t go straight for the jugular, more understated tunes like ‘Feast Your Eyes’ and the title track falling short compared to the excellence elsewhere. Seven minute closer ‘Diamond in the Witch House’ also fails to really go anywhere, a captivating intro and now-obligatory Scott Kelly guest vocal performance the only real elements of note. 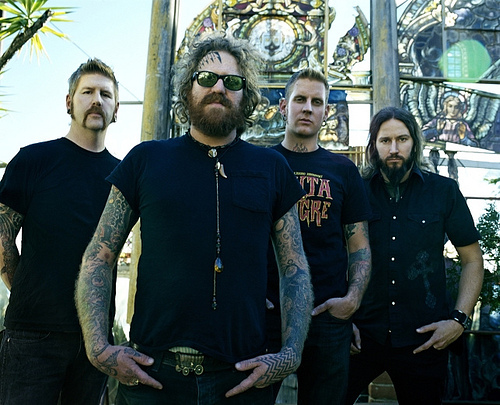 Only the psychedelic slither of ‘Asleep in the Deep’ really shows the subtle side of Mastodon at its most effective. By fusing the sludgy rumble of their early work, the scope and ingenuity of albums 3 and 4, and the more immediate delivery of The Hunter, Mastodon have gifted the world a comprehensive summary of the excellent band they are. Some may be disappointed that Once More Round the Sun doesn’t really break new ground, but considering how far its creators have come it’s difficult to envisage how else they could renovate their music. Perfectly balancing technical chops with songwriting excellence, Mastodon remain an example of how a metal band can be successful and unique without sacrificing an ounce of integrity or imagination.